One can never be too safe. Even in the security of short-term accommodations, businesses have to do their part not just for assuring security against any criminal activity but also guarding against any uncontrolled access that can interrupt guests’ stay. Short term accommodations’ reputation starts on security. Installing a fence is the most cost efficient and one of the most logical moves. Fence installation need not take long and cost a fortune and for this, using a modular fence panel, not a custom fence, is the answer. Such is the attention that this barrier enclosing your business gets from potential customers that you should carefully choose the fence you’re going to have installed. With the work mostly done for you, installation, repair and replacement of a modular fence panel is going to be a breeze. The most important aspect you have to consider before getting a fence is the material the fence is going to be made up of. Sure, you need it to be cost efficient and you know what type of fence to get for that. You need it to have installed fast, you know what to get for that. You also need a front yard fence? You also know what type of fence is perfect for that. So, what are the materials that modular fences can be made up of? * Wood. 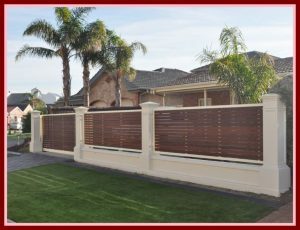 If you don’t like maintenance on your fence every couple of years, choose another modular fence panel material. However, wood is very easy to work with and if you like a different look to your business courtesy of a new fence every few years, this is the smartest choice you can make. * Vinyl. Popular for having the lowest maintenance ever, you’ll never worry about getting it stained, getting it repainted or having them rotting. It’s because of these that they’re popular substitutes for wood-looking, minus the splinter, fence designs. * Steel. Because it usually has pickets spaced three to four inches apart, there’s high visibility and security in this type of fence. If they’re tall enough, they’ll be difficult to climb offering more security. However, if you’re in Queensland, rules in residential property fencing in Gold Coast state that only a maximum of six feet is allowed, so consider this also. With the competition in short-term accommodations getting tighter, buildings are also getting nearer each other. Privacy and security are getting more reclusive than ever. A modular fence gives you privacy, security and with its appeal, it also raises your business’ value.